Successfully Added Special Ops. 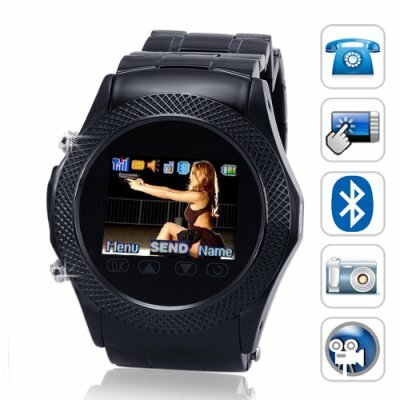 - Quad Band Touchscreen CellPhone Watch (Black) to your Shopping Cart. From China with love. This stunningly gorgeous mobile watchphone comes in pure black and all around Stainless Steel. This is a fully functional unlocked GSM mobile phone that's got a 1.5 inch touchscreen LCD display, with built in multimedia features, Bluetooth and supplied with a Bluetooth headset and a bonus 1GB Micro SD card. The Special Ops. is compatible with the popular four band GSM frequencies (850MHz, 900MHz, 1800MHz, 1900MHz), meaning you can use The Special Ops. watchphone anywhere in the world. This digital watchphone is crafted with amazing detail, and engineered with the user in mind for faster and simple use of the internal menu interface. Use the Special Ops. mobile watchphone as it is meant to be, pair it to the included Bluetooth earpiece to start making/receiving calls and listening to music. Kill some time during your daily commute, and tune in to your favorite radio station. The Special Ops. watchphone touchscreen interface comes with touch sensitive icons and is carefully calibrated to help make navigating through this mobile watchphone fast and efficient. The Special Ops. watchphone is also provided with a Bluetooth headset and a pair of earphones, and also includes two lithium-ion rechargeable batteries, making this a complete communication tool for use as soon as you open the box. The Special Ops. watchphone comes fully unlocked, meaning you can you use it with the network of your choice. Let's not forget, this is still a fully functioning digital watch with time, date and day display with programmable alarms and to do lists for keeping you on schedule and in style. The Special Ops. is a special edition cellphone watch and is available for a limited time only, with limited stock availability. This really cool special edition mobile phone watch is in our warehouse right now, so place your orders today, before there all gone. the Special Ops. is proudly brought to you by the leaders in wholesale electronics, Chinavasion. - Phone Book - Search Entry, Add Entry, Copy All, Delete, Caller Group, Extra Number, Settings, Caller Picture, Caller Ringtone. Is the CVSL-M85 water proof? No, the CVSL-M85 is weather proof, but not water proof. I like the CVSL-M85 very much well but if China Vision found a way of making it a waterproof, am sure it would attract very may other security personnel to purchase it to. Have a nice day every one'n God bless. Love this cellphone watch. Cant lose it or forget it somewhere. Easy to use. Excellent quality.Work great. on 2010-05-04 22:55:05 Faster than fast !!! I ordered the watcha nd got in in speed time of 4 days within the order. Everyting intact and as described here. Packed well, good quality, fast delivery. The watch is a bit big, would defintely suit if you have a a thick wrist. Amazing product Amazing company, keep it up Chinavasion!